Central Vacuum Motors | Cana-Vac Systems Inc. Central Vacuum Motors | Cana-Vac Systems Inc.
With any central vacuum, it’s all about the motor! It’s the heart of your system and in reality, what you’re paying for. However, not all vacuum motors are created equal and motor performance specifications are hardly a barometer of whether a motor is good or bad. Most manufacturers use either Thru-Flow motors and/or a combination of Tangential Bypass and Thru-Flow in their systems. 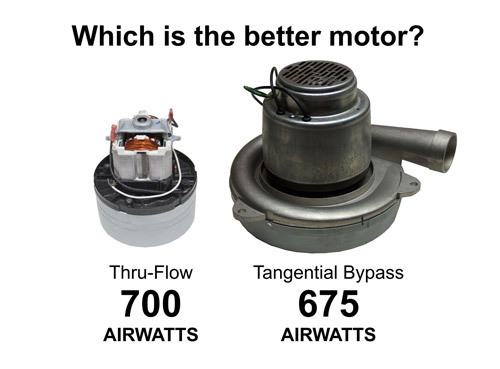 While the Airwatt performance of a Thru-Flow motor is often higher than a Tangential Bypass, the reality is that a Tangential Bypass is a superior motor for reasons we’ll explain later. Despite this reality, you’d be surprised at how many top brand name central vacuums use these smaller Thru-Flow motors in their high retail priced central vacuums. After all, the consumer is conditioned to shop on Airwatts and rarely asks about the motor type. In fact, very few manufacturers use the industry’s largest Ametek/Lamb 8.4” Tangential Bypass motor in their premium models even though it’s the biggest motor available and has superior technology that improves life expectancy. However, with growing pricing pressures, more and more manufacturers are opting for less the expensive Thru-Flow motors and using their high Airwatts as a performance sales feature. After all, Tangential motors can easily cost 4 times more than a Thru-Flow. So, if a manufacturer isn’t telling you what type of motor they’re using, assume it’s a cheaper Thru-Flow motor. Find out for sure by asking to see what’s inside. After all it’s your money and it stands to reason that you’d want to know what motor is in the unit you’re paying for. Consumers are lead to believe that Airwatts are the true measurement of how powerful a central vacuum is. What they may not understand is that there are other considerations to take into account. For example, suction plays a crucial if not more significant role in the actual cleaning performance of a central vacuum, where it really matters…at the end of the vacuum hose! Benjamin Franklin once said, “The bitterness of poor quality remains long after the sweetness of low price is forgotten.” Truer words have rarely been spoken. At Cana-Vac, we’d like to note that the retail prices of many of the Top Brand name products do not reflect the use of less expensive, lower performance motors. Yes, these higher priced brand name central vacuum units keep their manufacturing costs down by using Thru-Flow motors and yet charge a hefty retail price knowing they it will go unchallenged because the consumer will use Airwatts as a prime indicator of performance and value. Don’t get us wrong. Thru-Flow motors aren’t bad. They’re just not as good as a Tangential Bypass motor for a central vacuum application and you should certainly expect to pay less at retail. Cana-Vac uses Thru-Flow motors in our Ethös line of central vacuums and unlike some competitors, we price them lower than our premium Tangential motors which, of course, they should be. After all, our cost on a huge 8.4” Tangential motor is easily four times higher than the average Thru-Flow. Thru-Flow motors do offer great performance at an affordable price. If you have a smaller home or condo, don’t have pets or children, and/or aren’t planning on staying in your home for years to come, the lower investment of a Thru-Flow system may be the best choice for your needs. Now you may notice Thru-Flow powered systems that are rated to clean large homes in excess of 12,000 square feet. Will they? Yes. Should you expect it to last as long as a Tangential Bypass system in a 12,000 square foot home? No. If you clean frequently, have a larger home, and/or have a growing family with pets or children, we’d recommend a Tangential Bypass motor system because they are designed for a heavier work load and usage frequency. Why are Tangential Motors the better choice? 1.) A Thru-Flow motor uses vacuumed air to cool itself and does not have a dedicated cooling fan to cool the armature. As such, this motor is using cooling air on average 33% hotter than a Tangential. A Tangential Bypass motor on the other hand has a dedicated fresh air cooling fan on top of the motor to cool the motor and uses cooling air at the ambient temperature of the room. 2.) 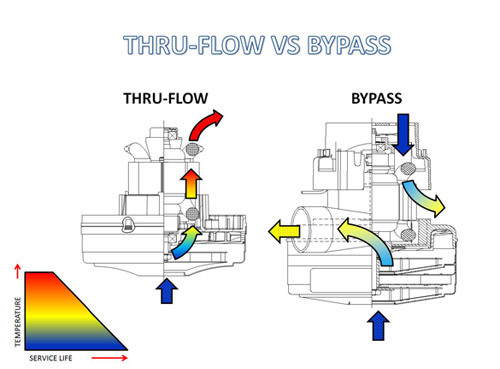 A Thru-Flow uses the dirty, albeit filtered vacuumed air, to cool itself. This contaminated air passes directly over the internal working components of the motor. A Tangential-Bypass motor on the other hand uses a separate fresh clean air fan to cool the armature and dirty vacuum air will ‘Bypass’ and internal motor components and exhaust Tangentially. In other words heated dirty air is never in contact with crucial motor components hence is a lifesaving feature of a Tangential-Bypass motor. 3.) The motor laminations on a Thru-Flow motor (as seen on the following page ‘Motor Anatomy’) are household rated and are smaller. These smaller laminations, according to Ametek/Lamb are heat intolerant to thermal and mechanical abuse unlike those on a Tangential-Bypass…couple that with hotter cooling air in a Thru-Flow motor and this is quite significant. Tangential Bypass motors on the other hand use heavy duty laminations. An Ametek/Lamb 5.7” Tangential motor uses 3 Inch commercial grade laminations and even larger laminations on 7.2” and 8.4” diameter motor. 4.) As with any central vacuum motor, the more you restrict the vacuum air, the faster the motor runs. (You can observe this on the motor bulletins shown on the Airwatts page of this central vacuum buyer’s guide under the column RPM). What does this mean for a Thru-Flow motor? Well the faster the motor runs the hotter a Thru-Flow motor will get with sealed vacuum being deadly for a Thru-Flow since there isn’t any Airflow to cool the motor. So why is this important? Well consider the inherent Airflow restrictions of a central vacuum system such as the filter, plumbing etc., but add a restrictive crevice tool or the inevitable ‘kinked’ hose effectively cutting off cooling to a Thru-Flow motor. Now here is what’s really interesting. Since a Tangential-Bypass motor uses a cooling fan that runs at the same RPM of the armature, when air becomes restricted the Tangential-Bypass motor actually runs cooler! This is quite a significant feature which prolongs motor life. 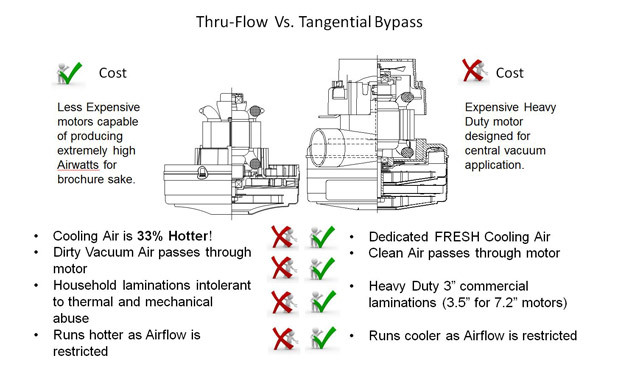 There are many more technical reasons why a Tangential Bypass motor is superior to a Thru-Flow motor. However, suffice to say that if you are shopping for a central vacuum and if it is within your budget, Cana-Vac recommends choosing a manufacturer’s Tangential Bypass motor offering.